I've had in my listening room many loudspeakers that have been my landmarks in the course of time. Here is a list of some of them: Martin Logan, Avalon, MBL... Today, my JBL 4350Bs are the best among those that I have tried for many reasons I will not state. It's a model of the 70's, with an old fashioned look and it belongs to the history of the famous Californian brand. All this until Harman International, the proprietor brand, has decided to revive the Studio Monitor line, the line that was present in all the main recording studios all over the world. I had the chance to test properly the new line. I find in it that sound that is the hallmark of the brand and is always present alongside with the differences among models due to the dimensions and characteristics of the loudspeakers used to build them. This time JBL4429 are under test. This is a top of the JBL Studio Monitor range, right below the 4465. It is a 3 way speaker with a woofer with a 300 mm paper cone, a compression driver with a titanium membrane for the medium high range and a titanium tweeter. The sensitivity at 91 dB is in the average. They weight 32,5 kilos each. The 4429 model is defined bookshelf despite its dimension - 635 mm height - and it needs 35/40 cm supports. As you see in the picture 4429 is a horn loudspeaker exception made for the woofer. 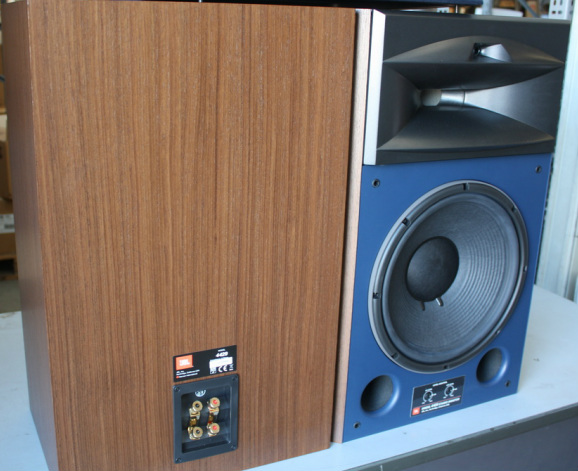 As for the rest we have the usual cabinet in veneered walnut and the characteristic blu front panel that has a slot for the high and medium-high frequencies faders. In the pictures you can see their likeness with their older sibling of the 70's. Jbl 4429 have been connected to the following system: Turntable Basis 2001, Graham 2.2 tonearm, Scan Tech Lyra Helicon cartridge, phono cable: LAT International XLR, phono preamplifier: balanced Einstein "The Turntable's Choice", cable between the phono pre and pre amp: Transparent Super XLR, CD/SACD player dCS Puccini+U-Clock Puccini, loudspeaker JBL 4350B, loudspeaker cables: MIT Magnum MA, power cables: MIT Shotgun AC1, Black Noise Pearl and others hand made, net filter: Black noise 2500. The first track I decide to listen is Paul Dukas’ The Sorcerer's Apprentice (SACD Pentatone) executed by the Orchestre Philarmonique de Strasbourg directed by Marc Albrecht. You can immediately portray the Orchestra thanks to the high resolution driver for the medium range. The percussions's place is exact and respects the presumable depth. In the Scherzo the bass goes very deep and it has a strength that is typical of loudspeakers with a bigger woofers diameter than that of those used for these speakers. The orchestra is bigger than the listening room, despite the horns directionality. As for the horns: dynamic seems to have no limits! While writing, a LP by Pino Daniele ( Bella 'Mbriana, EMI) is playing and the bass - drum set accompaniment shakes the couch, without loosing its comprehensibleness. There isn’t any perceivable distortion in the low range, even at high sound pressure. The voice I hear is the voice of Pino Daniele just like I knew it 30 years ago when he was recording his LP "Nero a Metà" in the Castello di Carimate recording studios. Let's go back to acoustic music with the CD of the Symphonies 3 & 8 by Schubert (DG), performed by the Wiener Philharmoniker directed by Carlos Kleiber. This CD is a gift by my friend and colleague Domenico Pizzamiglio whose authoritative impressions on the sound of these JBL you'll read soon afterward. This CD demonstrates how the DG German recording and mastering technology is advanced and how far we can get with the obsolete Red Book technology. The processing of the analog master tape of 1978, recorded at Musikverein in Wien, called "Original-Image Bit-Processing" is at the top level. JBL 4429 take us, aided by this wonderful recording, straight into the Wiener hall room. What else can we desire to obtain from a music reproduction system? The bows are full-bodied, the double basses underline the different passages without interfering on the voices of the other instruments. The medium range suffers rarely from the nasality of the trumpets and denotes minimum colors, at the edge of audible. There is the correct space for the soundstage and the sense of vitality of the orchestra is perfectly turned in. 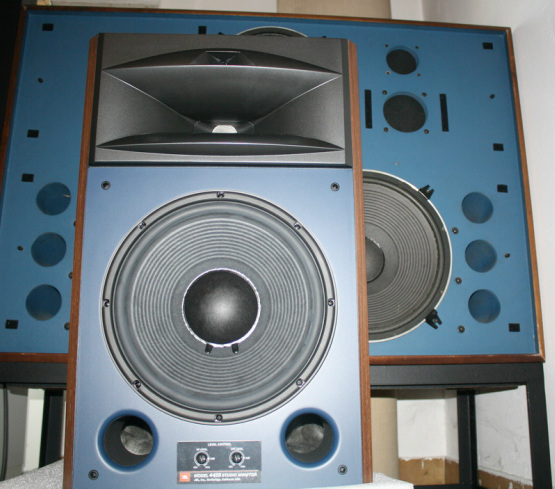 The price for these speakers is 6.000,00 euros for the pair. They are not cheap but their sound is something that has not many comparisons, in this price range. My conclusions: exception made for the planars, that are a world apart (advantages and disadvantages), there are not valid competitors for these JBL. If I hadn't their bigger sisters I'd get a hold on them. And, what about you, with those small and distorting woofers, with that laid-back medium range? What are you waiting for? Hurry up and go to listen to them, I bet you'll be grateful to me. To review these JBL loudspeakers in the listening room of my good friend Angelo, I have chosen material that can point out all the issues in the listening, good and bad things in the instrumental or vocal timbre and that can put to the test all the dynamic characteristics. I chose first of all St. Matthew Passion conducted by Herreweghe (2000), Fratres by Arvo Part on Naxos, Mahler’s Fifth Symphony directed by Solti on Decca, the Firebird by Stravinskij in the execution of Dorati on Decca, the Anthem for the Foundling Hospital by Haendel on Oiseau-Lyre and, last but not least the Cantata BWV 132 by Bach from the integral Harnoncourt/Leonhardt on Telefunken. Dynamics are not a problem for all JBL professional monitors and these 4429 make no exception; high volumes are easily reproduced with no fatigue for the listeners'ears. Listening to Fratres, I notice that the accompaniment of the double basses on the same long note, undergoes many intensity changes as it probably happened in the reality during the recording. It's impossible even for the most skillful bassist to maintain for eight minutes the same identical note, both pulling or pushing the bow. As far as the timbre is concerned the feared trumpet horn effect is not perceivable, or better, is perceivable with instruments that already have a nasal voice on their own like oboe, clarinet, bassoon and so forth. As for the rest, if the position instructions in the operating manual are respected, the sound is not colored and the human voice is highly credible. With The Firebird, the timbre of the instruments was correct and the dynamic was at times so violent to change the mind of those that think that the belt turntable (we used a vinyl for this listening) is slow and lacks of dynamics. The soundstage is just as deep as it should be and there are no annoying blanks in it. The only thing that I want to underline is that sometimes the high range of frequencies is not as sharp as it should but the JBL 4429 have tone controls that we have expressly kept flat. Six thousand Euros are not a small expense but the performance justifies its cost. JBL 4429 belong to a high class of professional monitors upon which JBL built its history and its heritage can be clearly recognized.